Genesee Ice Beer | Genesee Brewing Co. / Dundee Brewing Co.
Last week I saw 24oz cans of Genessee Ice at 99cents a piece and decided I had to try this as another possible option for cheap beer. Appearance could best be described as light copper color with a fizzy white head showing a lively carbonation. Aroma is grainy and a bit of a corn aroma too, both being a bit stronger than your typical adjunct beer. Taste is heavy on the corny grain flavor with a healthy dose of metallic flavor mixed in too. For the style, I would say this is packing more flavor than your typical adjunct lager and it's not that appalling either. I find this beer to be reminiscent of PBR but better. Mouthfeel is crisp but it's rather heavy feel makes it less refreshing than many adjunt lagers. My overall impression is you get what you pay for with this beer. Cheap beer will always have a place in my fridge because I hate to waste good beer on a wrecked palate and at 99cents for a 24oz can I will gladly add this to my list of worthy cheap beers. I dont know if we have the cheapeast prices in Mad Town or what. This 24oz can was 99 cents truly a working class price. They have had Genesse in Wisconsin for a while now. I really enjoyed the Genesse cream ale out in Buffalo a few years back, lets check this out. I think I want this in the can, but i'll poor a bit out in this Old Style glass just to get a look...noticeably darker gold than most lagers, slow disapating head. Heavy sweet corn with slight metallic aroma. That color again, different. First nip, kind of bland. From the can, bland, metallic. Grainy, corn, slighty sweet. Not all that good. Might be alright sittin out back with one of my Parodi cigars. I like the look of the old school can, the color of the beer is the best thing going for it. For 99 cent you cant go wrong. Golden colored beer with a rapidly fading head. Taste is the usual graininess you get with macros. I like this beer and if you go by the style it fits perfectly. From: Grocery Outlet in Allied Gardens (San Diego), Calif. Smells of roasted grains and sweet corn. Some rice. Taste is exactly like the nose. A little on the sweet side and faintly metallic. Not quite as flavorful as the Cream Ale. The feel is surprisingly medium bodied. It has high carbonation and a pretty smooth finish. While this is normally a pretty good feel for a beer, it's not what I'm looking for in a beer like this. It's almost a chore to get down. Overall, not a terrible representation of an AAL, but not a good one either. It's basically just a beer with a good price for a decent buzz. After trying the cream ale by Genesee, I needed a cheap beer for some change and this is what I picked up. I was really unsure because it just says "ICE Beer" on it. Not knowing what it would be like compared to the green can. Cracked the 24 fl oz can and poured it into a lager mug, my favorite mug. Pours a common golden color, decent foam head depending how aggressive you are with the pour. Smell, like the green can, I couldn't smell anything, from the can I got a faint hint of your average cheap beer, but in a glass, even fi I bring my nose to it, I can't get anything. Taste, like the green can, has a roasted malty flavor, but less than the green can. It's a good flavor, especially considernig the price and it's not watery. Feels smooth, easy to drink, almost creamy feel to it. Overall, for cheap stuff, it's good, I can see the taste not being appealing to some, but for the price, it's not watery, nothing much to complain about here. Dark golden color with a small rocky white head and slow moving large carbonation bubbles moving slowly through it. Yeasty white bread smell with some sweet notes. Thick creamy malty sweet taste. Feel is somewhat described in the taste above. A medium mouth feel that has a very pleasing creaminess to it. Finish was a pleasing wash of wet refreshment that drops off slowly and cleanly. This one was a real surprise! I like several of the offerings from Genesee as they fit the bill for a tasty beer at an incredibly low price. This one I found in 24 oz. cans at our local grocery store. Since I had not seen this before I thought I would give it a try. And I am glad I did! This is a very nice creamy beer and if memory serves me it was only about $1.40 for a can. Pretty good beer for an inexpensive adjunct lager. This isn't one of the new "Zima" crap beers. This is a beer flavored beer. It looks like beer. It tastes like beer. It's exceptional served ice cold on a hot, humid day. Currently this beer (which tastes surprisingly like the beers my Father and his Father before him drank), runs 99 CENTS for a 24oz can. Feel free to run this brew down and waste your cash on crap brewed beers that are cloying and undrinkable. It's beer-flavored beer for me! Got a single 24 oz can of this recently. Poured into one of my pint glasses, this beer pours a clear, medium to dark golden color with lots of streams of little bubbles fairly rapidly and continuously rising to the beer's surface. Has a white head that's over an inch thick when first poured that settles eventually to a thick ring lining the inside of the glass along with a nice, thick, creamy looking layer of surface with good lacing. Aromas of some lightly breaded malts, a bit of apple, and a bit of alcohol. The taste is pretty the same, with some lightly breaded caramel malts with a bit of sweetness that gives way to some graininess and a bit of grassy corn. Unfortunately this also has a bit of a metallic adjunct flavor. Not really an discernible hop flavor here. Has a fairly crisp, yet smooth, light to medium bodied mouth feel. Has a clean finish with a slightly dry and somewhat metallic aftertaste. I've had better beers of this style and I've certainly had worse. Looks much darker than your average adjunct ice beer. With a limited head and no lacing. The smell is of tasted malt and something astringent with a hint of alcohol. The taste is toasted malt and not the usual corn overload you would find in this style. Not many or any off flavors. Medium to heavy mouthfeel, with strong carbonation. This is extremely heavy for the style. Overall, I find this to be a remarkably nice surprise for the category. It masks almost all the unpleasant characteristics you find in cheap ice beer. Oddly I find this beer to look and smell like a strong Guinness blonde. Highly recommended if you really want an adjunct ice beer. 24oz can served in a standard pint glass. pours a crystal clear dull yellow/gold tone with a short lived, foamy finger of off-white head; no real lacing to speak of. light bodied, medium to high carbonation. goes down easy enough if one was interested in drinking a bunch, just not sure why that would ever be the case. Bought this 24 oz. can at the Front Street Binghamton, NY Weis Grocery Store, which used to be my one-stop shop for Horseheads Brewing Company bombers(not stocked anymore). $1.99 seemed reasonable. After consumption, a 200 mile drive back there for a refund was on the table. OK I'll admit that I downed this during an Adele special on NBC that there was no escape from in my house, and perhaps that made everything seemed worse than it actually was...but the corn soda flatness and salty sting of this beer's taste was beyond vindication; and I'm a Genesee fan when it comes to 12 Horse or Bock, or maybe even I'm a little bit partial to their Cream Ale. Sorry, 6 oz. of this met the drain head on. What aspect of beer like this is "ICE" describing, anyway?? S - Typical macro aroma. Wet hay and grain. T - Mild caramel sweetness with more grains and corn. Small metallic finish. F - Thin body. No aftertaste. Actually goes down easy. O - Not offensive to the palate. Some mild sweetness makes it a better macro choice than others. Honestly, this is a beer for the dollar-deficient working-class man who simply needs to forget the day of back-breaking work he just endured. This beer doesn't have many pleasant characteristics, other than the fact that it's cheap. A 30-rack is about $20, depending on where you are, and if you're willing to overlook what it lacks in quality, you will be satisfied with how drunk you get. Then, when you wake up in the morning, the satisfaction will quickly dissipate and in its place: agony. T - corn, light green apple, alcohol, bread, carbonated water. Honestly not that terrible. O - its comparible to Mickey's. Ice beer that's not all that strong at 5.5%. The plain black can with block letters makes me happy. Poured a typical pale straw color, white fluffy head that fades pretty fast and there is little lacing left on the glass. This is a drinkable ice beer that is just under the too sweet flavor that turns me off. This is a hard to find beer in the Chicago and Milwaukee area. I found it in Madison. Worth a try if you like ice beers. Found this locally and after tasting found it wanting. I like Genesee generally and this was a disappointment. Light color, light hops, medium texture and flavor with some malt in there that is overshadowed by the adjuncts. Fairly nice beer but the aftertaste rings adjunct like a bell. I know, you can't make high gravity beer without adding more fermentable stuff but the adjuncts used here achieve only the goal of higher ABV while marring the beer overall. There are cheap buzzers available for cheaper. This is a prime example of an AAL. Deep amber color. Corny and riddled with metallic notes. Head sticks around and lasts. At 5.5% it doesn't really hurt you. Be careful though, when this warms up it becomes a whole new animal. Probably won't buy again. 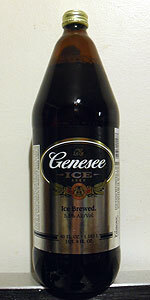 Genesee Ice Beer from Genesee Brewing Co. / Dundee Brewing Co.